Joan and I were looking for a way to escape the Seattle spring rains and settled on a few days in central Washington. I was interested in seeing something called the "dry falls" in the Grand Coulee area. It is spectacular and a geological wonder of the world but it's not what this report is about. While planning the trip I did some web surfing looking for other things to do or visit in the area. I learned about the Lake Lenore caves which are interesting too but also not what this report is about. A series of caves of geological interest and camping remains indicate ancient tribes stayed in the caves during traveling a possibly nomadic route. These caves may be hiked up into and you may enter the caves which do not go back very far. A more adventurous hike is also available here by finding a lone crack in the cliff wall north of the caves but south of the parking lot. After the stairs, instead of just going level to the caves climb up the the highest trail level and go south looking up all along the way for a crack in the wall. You see the wall is just a wall, not a cliff with a high plateau at the top. When you navigate up and up through the crack (I think it is the only way to get through the wall) you suddenly see that the wall yields to another parallel coulee to the Grand Coulee. This coulee is beautiful. If you look carefully across at the far east wall of that coulee you will see a solitudinal boulder standing up flat against the base of the wall. Head a little left of it at first and then in the middle head over to the boulder. You will be led into a labyrinth of rivulets of small coulees within the main coulee. It is like you are on another planet. I highly suggest this non-dangerous hike even though it won't bore anyone. This hike may sound dangerous, but actually it is just a little strenuous, so just take it slow. Takes about 2 hours for the round trip. On the way back if you don't want to re-traverse the sub-coulees, just go north around them as there is a nice trail. 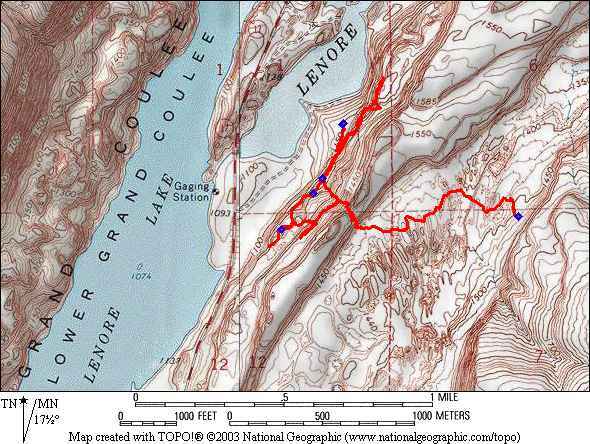 I would only attempt this hike during spring or fall as it might be so hot as to need more water than you could carry. The boulder, upon examination, may surprise you with a gift. Ok, here's the deal. I do not recommend that you read any further. The above description is everything you need to know. Grasshopper, your path is clear. Find the hike. Do the hike. The caves are pretty so-so but the parallel coulee is indeed worth a trip. I hiked up through the crack in the wall which is itself pretty cool. On the opposite side of the crack you look out across another coulee that most people will never see. From 150 feet up you can see that the floor of the coulee is incredibly scoured and criss-crossed with gullies that surround small basalt hummocks. The "maze". I gaze across to the other side looking for the "solitudinal" boulder. There does appear to be one boulder that stands out from the rest, a little bigger, but whether or not it's "solitudinal" I couldn't tell you. The view across the maze from the "crack in the wall". The "solitudinal" boulder is approximately in the center of the picture just below the ridge on the far side of the coulee. Click the picture for a larger version. Ok that's my goal. I look down on "the maze" and think, oh yah, no big deal, I can just walk a bee line to the opposite side, up and down the "little" rocky walls. maybe a little scrambling. no problem, I R rock climber after all. Joan was tired and decided not to join me on this one. The description says allow 2 hours so I conservatively told Joan I'd be back in 2 hours - no problem! Little did I know. Funny, from above the "maze" seemed pretty straight forward but from down here there's no perspective. Oh well, I know which way I'm going and I head off at a good clip. The desert floor starts off flat and only sparsely populated with sage. The going is easy for about 100 yards and gently rises onto one the hummocks. Hmmm. Pretty quickly I come to a 12 foot drop and have to backtrack. I pick a new line and again charge ahead... a different hummock and again am faced with another 12 foot drop. This time I have to backtrack all the way back flat desert floor where I entered the maze. In 10 minutes I've made no headway at all and from my current vantage it's impossible to tell where I'll find passage. I'm very frustrated and for a moment I consider giving up. It appears I'm going to have to use my head. Ok new strategy. I decide to head into the maze taking the low road, into one of the gullies instead of onto the top of one of the hillocks. This works ok for the moment but now I'm truly immersed in the maze, able only to see a little ways ahead and surrounded by 10 foot walls on either side. This is what a rat feels like. I follow my gully which climbs gradually to the top of another hillock. From here I'm free for a bit to head in the direction I want. I come to a small drop into the next gully and am faced with a new obstacle. The floor of this gully is full of sage and tall grass and other brush. I'm going to have to jump down into the middle of it and I'm worried about snakes. hmmm. I backtrack a ways and find and easy way to walk into the gully. With a stick I bang on the brush ahead of me hoping to startle any snakes into revealing themselves and fortunately nothing happens. I wade slowly through the high brush, being careful. The gully gradually narrows and the walls rise to maybe 20 feet when suddenly I'm up to my eyeballs in Monataurs! DOUBLE GAK! Ok, I made that last part up. After 20 minutes I estimate that I'm in the middle of the coulee. I'm committed now. Going back, even assuming I could retrace my steps, wouldn't be much easier than going forward. I smell cheese. I jump a short drop into a small slot and startle BIG CRITTER to my left. It thunders away into the brush turning into two deer (or elk?). I'm startled too and decide to go the opposite direction. My adventure continues for another 20 minutes when I finally turn into a gully that opens out of the maze onto the smooth desert floor. I've reached the other side! One last obstacle... a large, shallow, muddy lake bars direct passage out of the maze. I pick a direction and several minutes later I've circumnavigated and am out! I walk up onto smooth, higher ground scanning for the "solitudinal" boulder. I'm excited... but there are LOTS of boulders here and they all look alike and none are particularly interesting. I'm wondering if I got turned around in the maze and have emerged far from my target??? As far as I can see in either direction, nothing stands out. After everything I've been through I'm faced with the possibility that I might not find the goal rock. To my right I see a rock about a 100 yards away that seems a little bigger than the rest. I decide to investigate but I don't have high hopes. I envision myself going back and forth checking out every rock I see. I'm not a happy camper. Turns out it IS the right rock. Yes! 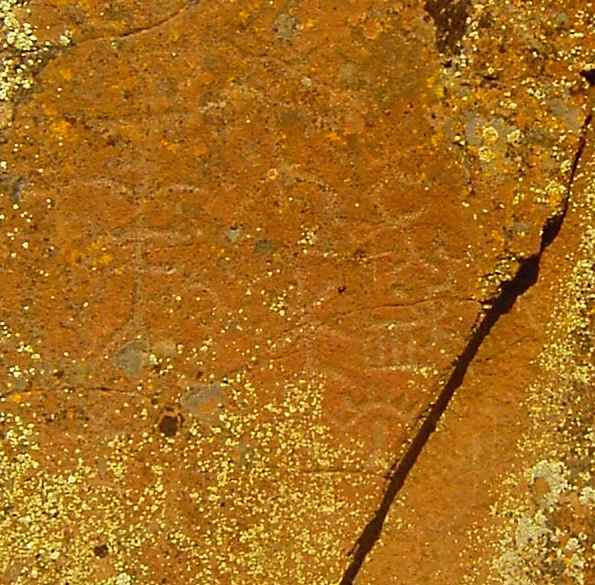 I had suspected in would have petroglyphs and indeed it does. Pretty cool. I've never run across anything like this in the wild. The view looking back. Where is the "crack"? I'm determined to find an easier way back but the first thing I notice is that from here you can't clearly see the "crack in the wall" on the other side of the coulee. Well, it's got to be there somewhere, I'll find it when I get there. Armed with the secrets of the maze the trip back is "less" of an adventure. I DO find the "crack in the wall" and wary of snakes I scramble up. One last look at this "Lost World" and I head back to civilization.